Now, we have access to eBooks for both kids and adults alike on many different devices. Here is an article to help parents understand (and educators) how to support students with reading issues. 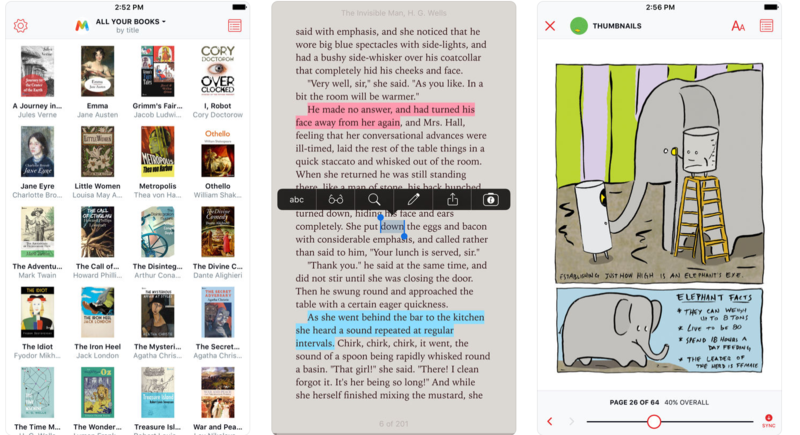 Case Study: I am looking for #apps that are suitable for kids for eBooks that allow audio. Using eBooks for Kids with reading issues whether it is visual processing, dyslexia or EAL (English as a second language). Whether you have a mobile devices such as an iPhone, iPad, Android Tablet/Phone, or computer such as Chromebook, Mac or Windows device there are ways of making things a lot easier for kids (and adults) with reading issues. I am writing this article from a parent perspective as it was a question raised in an amazing online support group that I am a part of on Facebook. What am I looking for with eBook apps? With each device there are often hidden features stored just to make things a little easier (the problem is knowing where to look for them). Here are some basic settings (instructions as well as images to get you started). 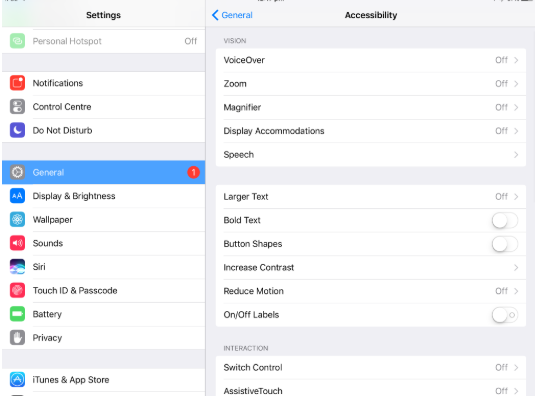 Go to ‘Settings on your iPad – tap ‘General’. 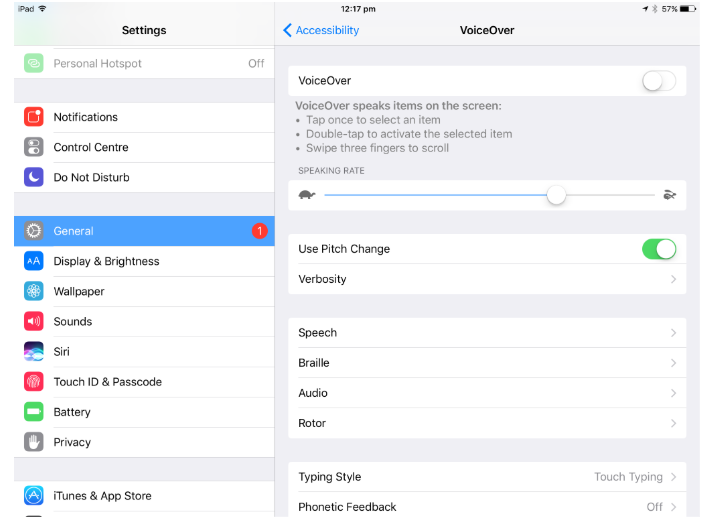 VoiceOver – switch this ‘ON’ by sliding the button to the RIGHT. You can change the voiceover if you don’t like KAREN. SPEECH: Switch ‘Speak Selection’ on -sometimes it is even better to have ‘Speak Screen’ also switched on as this is just a shortcut. Swipe down with two fingers from top of the screen. 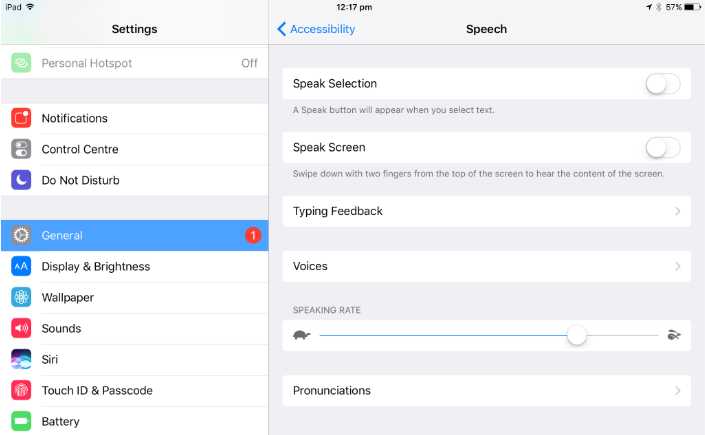 So, you don’t have to have a specific app that is TEXT to SPEECH specific as there are already inbuilt tools for #accessibility. However, there are apps for #eBooks. Here are some of my favourites – some well known and others not. There are suitable eBooks apps that can read PDF’s/ePUB’s (the International eBook format that is not Kindle). I have just discovered this app that was recommended on a great article about best #ebook #apps for iPad and iPhone for 2018. I have collected over the years articles, eBooks and other reading material which is stored in my Dropbox folders. Marvin allows me to go and find these books and then add them to the app. The great thing about libraries is that they are now purchasing a wider variety of eBooks as part of their book/eBook database. I often will go and find books for my oldest daughter as she might have finished her print books and is looking for something to read. Tip: Don’t forget that kids love comics and magazines to read (as do adults) and a lot of these libraries also offer digital magazine subscriptions as well. Press Reader and RB Digital are two of the magazine apps are what my library uses, but go into your local library branch or check out their website for more information. 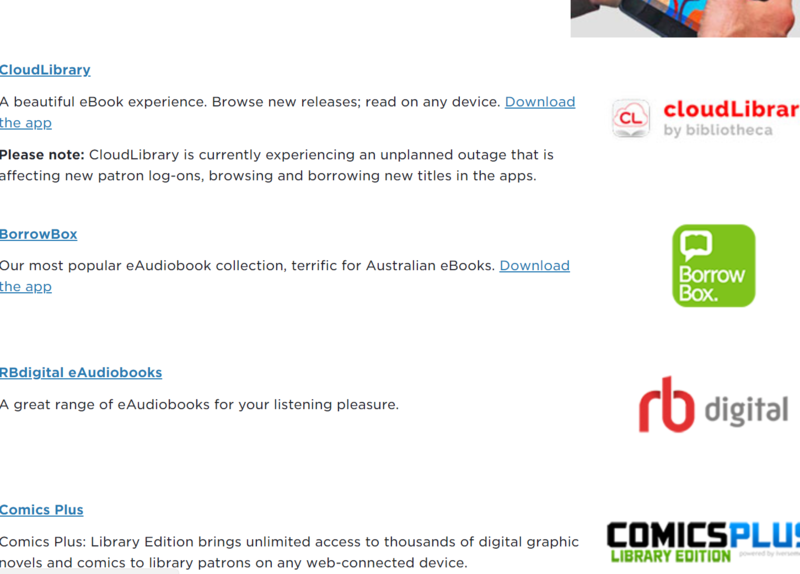 eBook App 3: City of Melbourne Library (open to residents of Victoria, Australia). You used to be only ever able to borrow books from the local council area that you belonged to (this has changed in recent years) and especially in Melbourne, residents of VICTORIA can access the City of Melbourne library (and not just the City of Melbourne residents). If you are ever in Melbourne CBD, check out the little library on Flinders Lane (near Degraves Lane). A great space to work and have some quiet time (and you can borrow books from here to). Here is how you sign up: (Go to the website to sign up ‘ONLINE’. This is what is available: (eBooks, eMagazines, eNewspapers and Audiobooks. Vision Australia Connect App: Once you are a member, you can order print materials ready for their app. The free Vision Australia Connect App automatically connects you to the online library catalogue using your smart phone, ipad, tablet, or other compatible device (see below). It is easy to download and use. “ You can either read material straight away (stream it with wifi) or download (with wifi) and read later. I still love my Kindle app (although as of the 1st July I won’t be able to access the US Kindle store, only the Australian version – which means less choice and higher prices. I often will get the Kindle version after I have read a paper version several times so I can take it away with me (or buy new books for holidays). I hope this blog post really helps. I often give this advice in various support groups and I am really determined to help parents understand where to go for #resources. To understand more about #assistivetechnology, view my previous post For further information regarding #assistivetechnology contact Megan at megan@techcoachhq.com.au or via the website. 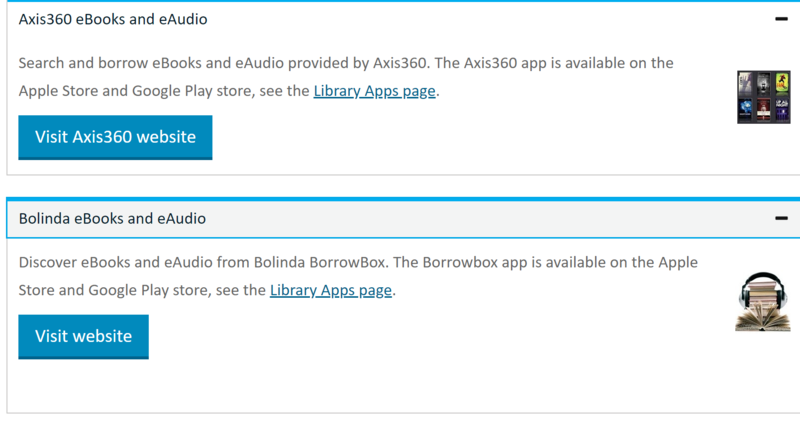 Stay tuned for where to find eBooks for your computer and Android.